When Amy and Jeff Belles welcomed their son Carson, they thought their happy baby was developing typically. “It wasn’t until years later we realized he lacked joint attention (pointing) and babbling,” Amy says. “He was verbal, having about 10 words, before regressing and losing all speech at 20 months. Once we realized he did not have a hearing issue, we quickly turned our attention to autism.” Carson, who is now 12, was diagnosed with autism at age 2. “The day we officially received his diagnosis, though we already knew in our hearts, it still absolutely crushed us,” Amy says. The Belles family realized that while their son looks at the world differently, like many others who have been diagnosed, Carson’s needs are not visible to most people. Carson, 12, sits in a “Headphone Zone” and plays with a sensory ball that comes in a sensory bag, along with headphones, sunglasses and other items to help all ages and abilities feel comfortable in the zoo environment. Carson is nonverbal as he understands receptively, but cannot verbally express his wants and needs. Currently, he uses a speech-generated device (an iPod touch with ProloQuo2Go) designed especially for his visual needs to communicate. He is a visual learner and needs visual schedules and cues. He also has trouble with verbal multiple step directions, so all tasks are broken down into smaller parts through task analysis sheets. Carson’s school and therapist have helped the Belles family to work on Carson’s needs. However, as with many families who have a child with special needs, the Belleses felt isolated, excluded and felt like “they didn’t belong” in social settings and among friends. Visit akronzoo.org for more information on the sensory spaces and bags. “Your family is now different,” Amy explains. “Your friends are sharing all the milestones their children are meeting, and you are left feeling empty, distant, and isolated in your autism world. Deep down it hurts to see your child not doing the same things, and for us, Carson was struggling with every aspect of his life (communication, behavior, sensory, anxiety, feeding, etc.). “We would be invited to events and, being optimistic, we would give it a try,” Amy adds, but the environment would be too much for Carson, and they would end up back in the car shortly after arriving. This happened when they tried to go to professional sporting events, restaurants, movies, the zoo, etc. Amy or Jeff would leave with Carson to go to the car and the other parent stayed with their older son, Mason. “We soon realized we needed to surround ourselves with people who were hopeful and believed in our son’s potential,” Amy says. Their drive and passion to help Carson navigate an often confusing and overwhelming world fostered a connection to KultureCity, an impact-driven nonprofit that is rethinking accessibility. It creates acceptance and inclusion opportunities within the community for individuals with special needs. Through their work with KultureCity, Jeff and Amy Belles created accessibility and acceptance in the local community by collaborating with the Akron Zoo and Quicken Loans Arena. The family helped to design spaces where individuals with sensory needs can feel safe and secure when needing a break from crowds and overstimulation. They recently completed refresher training for staff at Quicken Loans Arena in preparation for the upcoming Cavaliers season. 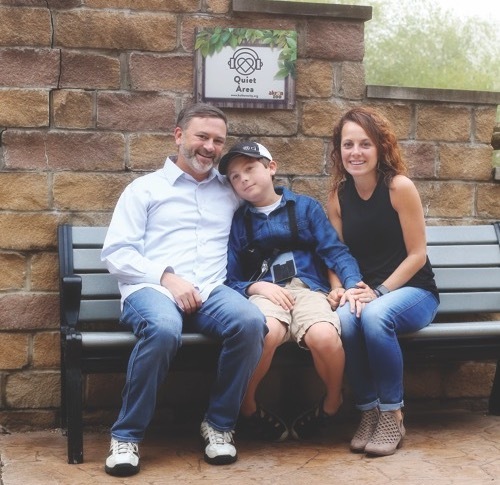 Now families like Carson’s can experience community events at the Akron Zoo and Quicken Loans Arena with trained staff and access to necessary tools, like sensory bags and sensory/quiet spaces to help accommodate the individuals and families. Staff at the Akron Children’s Museum, Lock 3, all Summit County Library branches, Canal Park, Progressive Field and other organizations also will soon attend training sessions to help create a sensory-friendly environment for people with special needs. Their dream is to see families, like their own, enjoy all the amazing opportunities northeast Ohio offers, and they are reaching their goals. For more information and to help create another sensory-inclusive community space for all families to enjoy, contact the Belleses and KultureCity at [email protected] or [email protected].